Accepted Scientific Name: Espostoa guentheri (Kupper) Buxb. Oesterr. Bot. Z. 106: 155. 1959 nom. inval. The first flower on a 3 metres tall specimen produced in October 2003. The cephalium growth started approximately one year earlier and is however already showing some of the intense colouration for which the species is well known. Interestingly the flower stayed open for two nights probably because of the cool weather. Altitude: 800-1300 metres above sea level. Habitat and Ecology: Espostoa guentheri occurs in seasonally dry forest vegetation within an inter-Andean valley, often covering a hillside, or forming a cactus forest with other species. The the area is dry and hot at times, but wet enough to support leafy trees and shrubs. Espostoa guentheri is quite common where it occurs. Ongoing road construction in the southern end of its range is reducing the population, but there are currently no other known threats. Espostoa guentheri f. cristata hort. Cephalocereus guentheri f. cristatus hort. Cereus guentheri f. cristatus hort. Vatricania guentheri f. cristata hort. Espostoa guentheri f. monstruosa hort. Cephalocereus guentheri f. monstruosus hort. Vatricania guentheri f. monstruosa hort. Description: Espostoa guentheri (syn: Vatricania guentheri) is a shrubby columnar cactus with attractive golden-spined stems that exhibit varying densities of fox-red lateral cephalia; that is, beds of woolly hairs grown on the sides of the branches from which comes flowers and fruits. 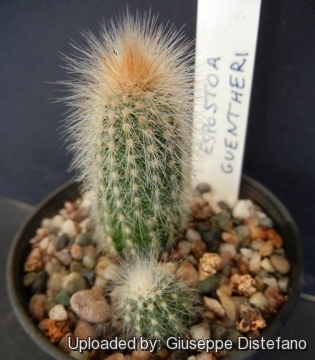 Any impassioned cactophile would like to see Espostoa guentheri in habitat. There is no sight quite like it. Habit: It grows in habitat to about 2 m high and will branch in age from the base and may have as many as fifteen branches. Stems: Pale green, erect, up to 2(-3) m tall and 10 cm in diameter. Areoles: Yellowish white, woolly, spaced about 1 cm on the rib. Spines: 15-25 spines, 5-22 mm long straw yellow. Cephalium: Lateral, up to 50 cm long, and 6-7 cm thick, that on average in mature specimens, occupies about half of the ribs, brownish, with reddish-brown to grey wool, reddish bristles and many spines 4-6 cm long. The cephalium, which is a zone of long, fine spines, first occurs superficially on one side of the stem but eventually grows to completely encircle the top of the plant often making them resemble elongated leeches. This can he achieved in a glasshouse but takes many years since the plant tends to he slow growing in cultivation. The cephalium is often oriented in only one direction, but now and then different branches will have cephalia facing in different directions. Given that this species inhabits proximity to the equator, where there is no evident advantage to orientation in any particular direction. Flowers: Campanulate to tubular, yellowish or whitish up to 8 cm long, 2,5-3 cm in diameter pericarpels and floral tubes with fine pinkish wool. Fruits: Roundish, scaly edible but not particularly tasty or sweet of odd texture and a flavour that ranges from indifferent to strange. Blooming period: The flowers come in early summer. Remarks: Espostoa guentheri was placed in its own genus Vatricania because it occurs in eastern Bolivia whereas all the Espostoas occur in Peru. It is probably polyphyletic because it is more closely related to Cleistocactus and Echinopsis huotii than to the other Espostoa species. Espostoa guentheri (Kupper) Buxb. : Shrubby columnar cactus with attractive golden-spined stems that exhibit varying densities of lateral cephalia. Distribution: Bolivia. Espostoa guentheri f. cristata hort. : Crested form. Espostoa guentheri f. monstruosa hort. : Monstrous form. 1) Lowry, M. 2013. Espostoa guentheri. In: IUCN 2013. "IUCN Red List of Threatened Species." Version 2013.2. <www.iucnredlist.org>. Downloaded on 23 March 2014. Cultivation and Propagation: It is easy to grow. Need a fertile, well drained soil mix. Water the plants well and allow them to dry before watering again. This species seems to do better with a little more water than most cacti. During the growing season fertilize them monthly with a balanced fertilizer. Espostoa produces noticeable amounts of growth each year if kept well fed and watered throughout the warmest months, particularly if it has been acclimatised to accept full sun. Once this cactus is established it can easily produce 20 cm of growth every year.